I recently had a question asking for a comparison of our memory foam mattress to Saatva’s memory foam mattress, the Loom and Leaf. We do not use any gel-infused memory foam as it is stiffer and less comfortable than pure memory foam. We have 2 layers of pure memory foam – 2 inches of 4-lb memory foam followed by 2 inches of 5-lb memory foam. Our memory foam has an open cell construction that increases air flow 95% over traditional memory foam and wicks away heat and moisture 3x faster than traditional memory foam. Memory Foam Mattress Firmness: Soft, Firm, or Somewhere In Between? Memory foam mattresses can come in many different firmness levels. When you are shopping for a memory foam mattress, it is important to know what type of feel you like. Memory foam can be very soft and marshmallow-like or very firm, just sinking in slightly when you lie on it. There are multiple factors that determine how firm or soft a memory foam mattress will feel and not all of those factors are determined by the memory foam itself. All memory foam mattresses are made in layers. 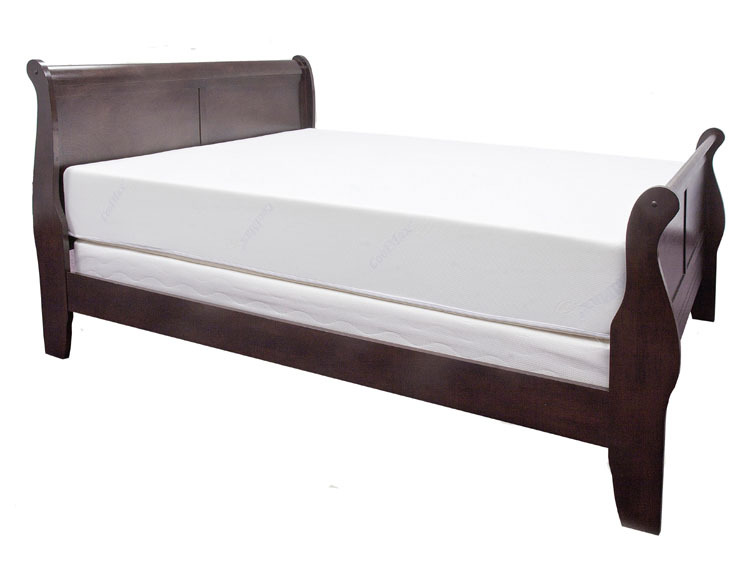 Memory foam is the top layer(s) and base foam are the bottom layer(s) that form the foundation of the mattress. No memory foam mattress is made of just memory foam. There is always some type of base foam beneath the memory foam. Author Angela L. HensleyPosted on May 6, 2016 May 6, 2016 Categories memory foam, memory foam mattressTags me, memory foam, memory foam bed, memory foam density, memory foam mattress, memory foam mattress density, memory foam mattressesLeave a comment on Memory Foam Mattress Firmness: Soft, Firm, or Somewhere In Between? As memory foam mattresses become more and more popular, there are more and more “facts,” or should I say myths, surrounding them. Let’s separate a few of the facts from the fiction and the myths from the reality. Fact – Although memory foam has a reputation for sleeping hot based on “leading brand’s” reputation for this, some newer more high tech memory foams have turned this to fiction. Our memory foam has an open cell construction that increases air flow by 95% over traditional memory foam and wicks away heat and moisture three times faster than traditional memory foam. In addition, the Healthy Foundations 10″ Memory Foam Mattress is also encased in a CoolMax cover. CoolMax is a unique cloth by Invista that is on everything from athletic wear to bedding and wicks away heat and moisture. Since our returns for heat are less than 1/2 of 1%, sleeping hot is simply not an issue for this memory foam mattress. Buying a Memory Foam Mattress: What is IFD/ILD? When you hear about foams, particularly memory foam, you usually always hear about their densities, but density isn’t the only measurement used in assessing foams. IFD, also called ILD, is the measure of a firmness of a foam. It measures the initial deflection of the foam under a load and is used for all types of foam, everything from memory foam to car seats. Author Angela L. HensleyPosted on March 4, 2016 Categories memory foam, memory foam mattressTags IFD foam, ILD foam, memory foam, memory foam bed, memory foam density, memory foam mattress, memory foam mattress densityLeave a comment on Buying a Memory Foam Mattress: What is IFD/ILD? Most people looking for a memory foam mattress want to learn about density and what that means. Quite simply, density is how much one cubic foot (length x width x height) of foam weighs. So does that mean that all memory foam with the same density is exactly the same? If only it could be that easy. Unfortunately, it’s not. The Healthy Foundations 10″ Memory Foam Mattress continues to distinguish itself from the crowd. With thousands sold, an amazing 96% of its reviewers would recommend it to a friend. What makes this mattress stand out in the crowd? First of all, the Healthy Foundations 10″ Memory Foam Mattress is unique because every aspect and every layer of its construction are of the highest quality. Of course you can get memory foam mattresses that are much cheaper, but they are made with much cheaper components. This means that they are not as comfortable and not built to last. Our mattress has a 10-year non-prorated warranty. Not only that, but our mattress is the only memory foam mattress in the industry that does not have a minimum sag requirement for a warranty claim. With other companies, you have to meet their minimum requirement or your warranty claim is rejected. Have a sag of 1.49 inches that is making you uncomfortable and the company requires a 1.5 inch sag? Too bad – you are out of luck. It is not that way with the Healthy Foundations 10″ Memory Foam Mattress. If a mattress has a sag or dip that affects your comfort, the warranty is honored. There are no “gotcha” clauses (and very few warranty claims).